Dream Bobsleigh, in Mario & Sonic at the Olympic Winter Games, is the Dream Event variation of the regular Bobsleigh event. In Festival Mode, players need to reach day 3 to unlock the event. The game is a dream event version of the game, meaning the game has more kicks, a CGI setting in a non-real place, and it also has items. The start and finish lines take place at Nocturne from Sonic Chronicles: The Dark Brotherhood, and the rest of the course takes place at the Special Stages from Sonic Heroes. The course also has elements from Mario Kart Wii's Koopa Cape, such as Item Boxes and obstacles similar to Koopa Zappers. The game plays just like Bobsleigh, though the game is actually now a race (unlike Bobsleigh). The game first starts with shaking the Wii Remote, then pressing when A appears on screen. When the game's race starts, the player must do something other than stay on the Gold Track in Bobsleigh; they must collect as much multicolored balls as they can to accelerate and gain points. The player can guide the bobsled anywhere around the 360 underwater tube (or in space for phase 2). Obstacles (such as spikes) are shown to take away multicolored balls. Items can give the player a speed boost (such as the Sonic Shoes) or take away multicolored balls (like the Thunder). Dream Bobsleigh also appears in the DS version, referred to as Blazing Bobsleigh. Big Bullet Bill is battled in this event. The player must race to the end without losing all of their health. The player may attack by pressing and left at the same time twice to attack another player on the left and twice press and right at the same time to attack on the right. Hitting walls, snowmen or getting attacked depletes health, and if any player loses all its health, they are disqualified. When the meter gauge on the right is full, the player may press to boost. Pressing rotates the sleigh. If the sleigh is facing the front (the way it starts aka the black part on the front), the player will not spin out of they hit a snowmen or take more damage, but will not go as fast as if the sleigh had the black part facing backwards. In other words, if the sleigh is facing backwards, they will gain speed, but take more damage from snowmen. Dream Bobsleigh appears in Mario & Sonic at the Sochi 2014 Olympic Winter Games, under the name Roller Coaster Bobsleigh. The event takes place in Speed Highway from Sonic Adventure. In the Roller Coaster Bobsleigh, players race in single person bobsleighs down Speed Highway, collecting rings to gain more speed as well as avoid obstacles such as robots or wrecking balls. 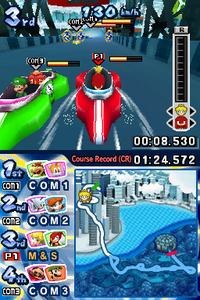 In the Wii version, user controlled teams have to use 4 players. However, CPU controlled teams only have 1 player on their team. This page was last edited on October 31, 2018, at 17:42.